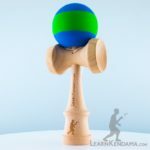 Learn how to do the Swing Down Spike kendama trick. In order to do this trick, you want to make sure that you know down spike and swing spike. To start this off, you are going to be holding the ken in the sara grip with the spike pointing downwards. You are going to start off by doing a basic swing spike. The tricky part with this is that it is really hard to track the hole since it is facing away from you. The easiest way to do it is actually to track where the string is coming out, because this is going to be exactly the opposite. So if you see that it is pointing down, you will know that the hole is a little bit higher up. It might make it a little bit easier to spike it. You really do want to bend your knees so that way makes everything a little bit slower and easier to track. You really want to make sure once you do spike it, you have to point the spike up really quickly or else the tama will fall right out if you do not move your hand out first. The trick is just, bend your knees, swing slowly, and track the ball, and that is how you do Swing Down Spike.